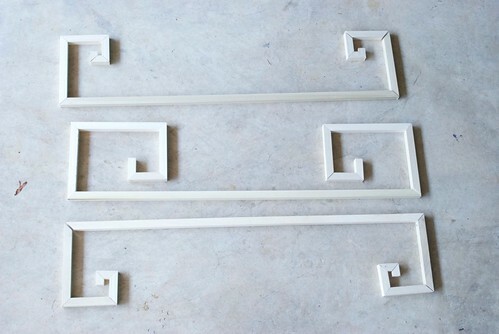 Thanks to Steve for cutting 30+ wood pieces to make these Greek keys! Sooooo, I decided to create my own Ikea Greek Key Dresser! I'm sure you guys have seen those DIY projects floating around the web that involve taking Ikea furniture and turning it into something custom-made. Well, I was so blown away by Bri and Jaimee's take on adding some glamour to an Ikea dresser that I had to do my own version of it too. 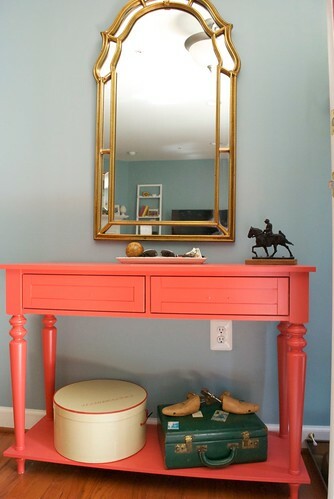 I've been wanting to get a new entry table/dresser and thought that this DIY project would be perfect for our entryway. It's not much of an entryway, but I want to make a big impact (in a modern way) the minute you walk in, since the rest of the room is pretty traditional. Current entry table - it was originally a maple wood stain, but I got bored with it and painted it "Bergamot" by Martha Stewart. It looks great, but doesn't really work with the rest of the room. Hence, this post. 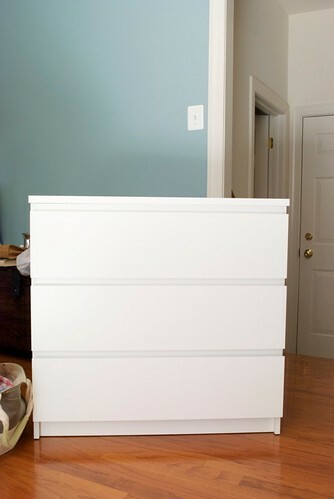 Bri's version which takes an older version of the Malm dresser and turns it into something really chic and modern. I absolutely love how she styled it! Jaimee's couture version of the current Malm 6-drawer dresser. 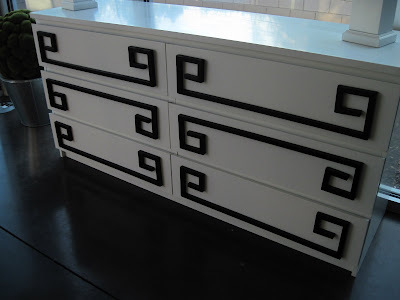 The Malm 3-drawer dresser that I'm using to create my own Greek Key piece. I was hoping to find one on Craigslist on the cheap cheap (and have it already built), but no such luck. But at $69.99, it was such a good deal brand new that I just sucked it up and spent 2 hours building it myself (with no help from Steve), isn't that amazing?! The tools for creating the Greek key wood pieces. I tried my hand at cutting a piece of wood and it took me about 10 minutes to make 1 cut. It was absolutely exhausting and just goes to show that I have no upper body strength. At this point I begged Steve to help me out with this project. A close-up of Steve's handy work. 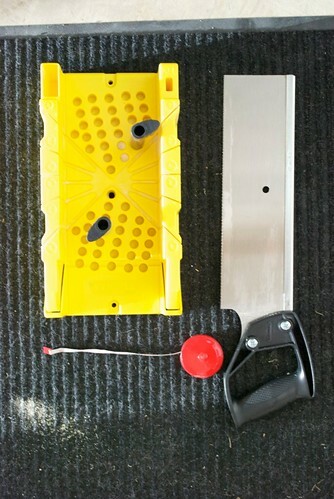 Amazing that he made those really small pieces with that miter box/saw kit. 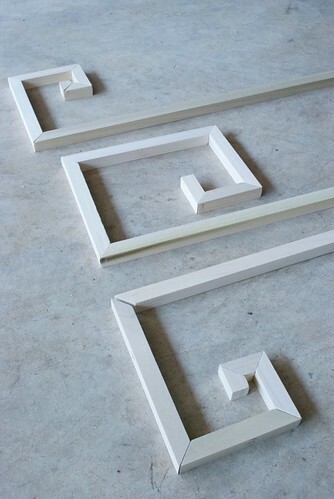 And...here are the beautiful Greek keys that Steve cut, all glued and painted. 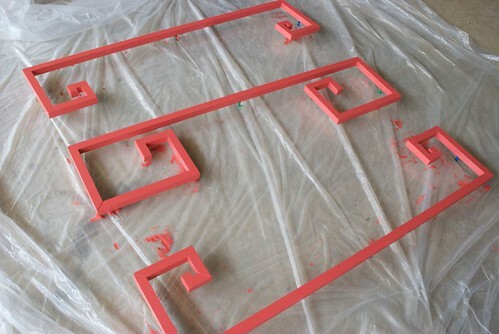 I'm waiting for the second coat of paint to dry before gluing it onto the dresser. Helpful tip: I stuck push pins on the backside so that the paint doesn't stick to the plastic tarp. I'm purposely not painting the backside since it's getting glued to the dresser and won't be visible. I promise, the minute the dresser is done I will post pictures of it. And I do have some interesting information on how I decided to shape the Greek keys, but more on that later! Promise! You guys are so clever and resourceful! I am impressed!